The imageRUNNER 1025N is designed with small businesses and workgroups in mind. Operating at speeds of up to 25 pages-per-minute (LTR), the imageRUNNER 1025N model supports digital copying, network printing, automatic duplexing, and color scanning features, along with the added convenience of a 50-sheet Duplexing Automatic Document Feeder. The imageRUNNER 1025N provides a compact desktop design as well as all the functionality needed in a single multifunction solution. Plus, its expandable paper capacity helps maintain uptime for every user. Delivering durable performance with high-end capabilities, the imageRUNNER 1025N device is designed to redefine small office and workgroup efficiency. 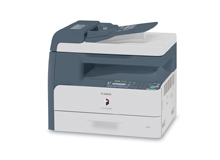 Operating at up to 25 pages-per-minute (LTR), the imageRUNNER 1025N is equipped with 128MB RAM. Exceptional memory capacity provides users with high-speed image processing of data and simultaneous processing of each function. With a scanning resolution of 600 x 600 dpi, and print/copy resolution of enhanced 1200 x 600 dpi, the imageRUNNER 1025N delivers outstanding, exceptional image quality for the most faithful reproduction of text and images. Standard TWAIN/WIA compliant color scanning enables users to convert hardcopy-based information into electronic format for storage or integration into your workflow. Compact desktop design allows devices to be placed in areas with limited space. An integrated output tray saves space and organizes output for speedy distribution. Standard automatic duplexing saves time and reduces paper cost by producing two-sided output without any manual intervention. 50-sheet capacity Duplexing Automatic Document Feeder makes scanning multi-page and different-size originals quick and easy. With a maximum paper capacity of 1,100 sheets, the imageRUNNER 1025N device has been designed to meet the volume requirements of any small business or busy workgroup. Standard UFR II LT printing to provide maximum flexibility and performance for busy workgroups and businesses. Optional PCL 5e/6 Printing Capabilities. Cutting edge image processing technology enables high-speed image data processing and the simultaneous processing of multiple functions. Standard 10/100 BaseTX Ethernet and USB connectivity. A suite of management features including Department ID mode for tracking/monitoring device usage and Remote UI for controlling system functions through a Web Browser.